Bored with ordinary chess pieces? Want to make your chess game more different and colorful? Or want to teach your children about chess game? Use this kind of color chess! All of your problem with chess pieces will solved. If you feel bored with ordinary people which are black and brown, you can change it with our color chess. 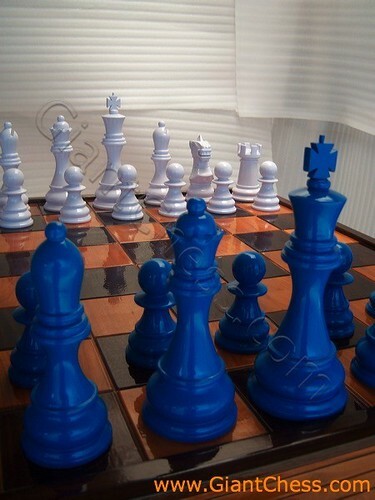 This time we have white chess pieces vs blue chess pieces. Those chess pieces will change your imagination of chess. A new color for wooden chess set. Blue color gives refreshment to your eyes and the white apply clear look. Combined by the brown chess table, it is perfect to be placed in your room. The products are made of durable natural material and clear acrylic lacquer. Get it now in good price!